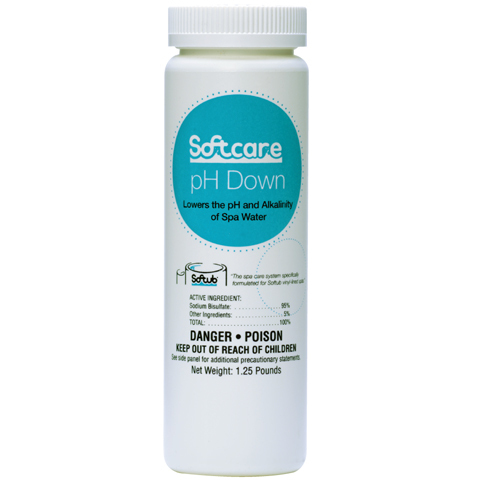 Raises The pH & Alkalinity Of Spa Water. Improperly balanced pH levels in a spa can lead to stains, scale, equipment corrosion, skin/eye irritation and coughing. 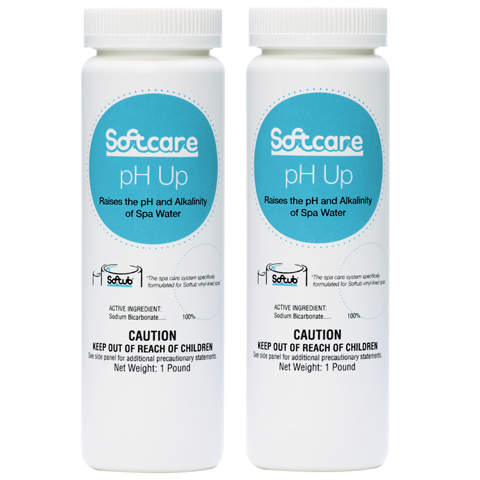 pH Up – Buy a 2-Pack and Save 15%! 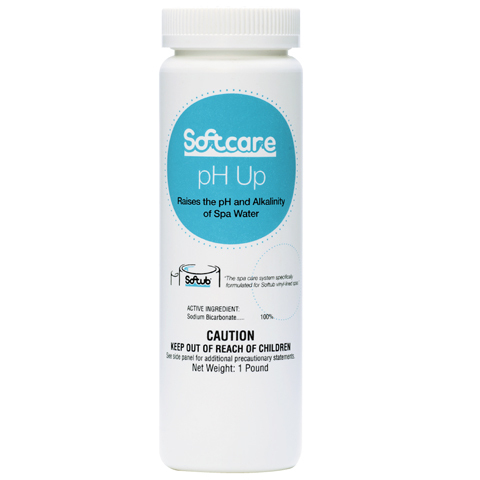 Softcare pH Up will increase the pH of Softub water. The total alkalinity of spa water should be maintained between 80 and 150 ppm as determined by a suitable test kit. Maintain the pH within the desired range of 7.2 to 7.8. 1 Order = Two 1 lb. bottles. Add pH Up at the rate of 1 oz. (2 tbsps) per 500 gallons of water. This dosage will increase the total alkalinity approximately 10 ppm and may be added directly to the spa or hot tub when pump is on high speed. After the initial application, allow water to circulate for approximately 2 hours. Retest total alkalinity and add second dose of pH Up if required. Continue process until total alkalinity falls in desired range of 80 to 150 ppm. Once proper total alkalinity has been attained, test for a proper pH range of 7.2 to 7.8. If pH needs to be raised, use pH Up at a rate of 1/2 oz. (1 tbsp) for spas up to 500 gallons. Wait 30 minutes, retest and adjust as necessary. Add pH up when test strip indicates pH is below 7.2 ppm. Start with 1 TBS to treat 500 gallons. Wait 30 minutes, retest and adjust as necessary. Note: You would never ever use pH up and pH down in the same day. Never mix this product with any dry or liquid chlorine product as a dangerous reaction may occur! Avoid contact with skin or eyes. Wash thoroughly after handling. This product may be irritating or harmful if taken internally. Do not store this product in close contact with chlorine products. Do not mix with any other chemical – mix only with water. If Swallowed: INDUCE VOMITING, give large quantities of water and call poison control center or doctor for treatment advice. Skin Contact: Wash all affected areas with soap and water. Wash clothing with warm soapy water before reuse.